(Newser) – Weak economic news from China, the US, and Spain combined with a slump in oil companies sent stocks sharply lower. 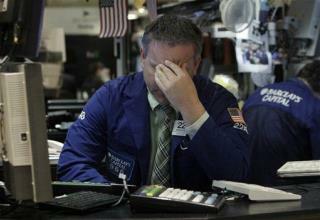 The Dow Jones industrial average had its biggest one-day drop since August. It fell 228 points, or 1.9%, to close at 11,984, while the S&P 500 index fell 24, or 1.9%, to 1,295, and Nasdaq fell 50, or 1.8%, to 2,701. So the republicans have completely failed to revive job creation like they claimed they would do if they were elected. Unemployment increased because Obama knows nothing about job creation. He knows how to spend, spend, spend. No special talent needed.